Eastwood MetroPark is a hub of outdoor recreation. With a variety of water-based recreational activities as well as land-based recreational and leisurely activities, the park offers visitors many opportunities to actively experience nature without leaving the city. *Kayaks and canoes permitted every day. Lake is open 24/7 from Apr. 1 until Oct. 31 for fishing only. School field trip tours are available by request. Call to schedule. Learn more about available field trips. Dogs are welcome, but, for the safety and comfort of all patrons, they must be leashed and under control at all times. The Buckeye and North Country Trails pass through Eastwood MetroPark. This section of the Buckeye Trail is part of a 1,440-mile continuous loop that completely encircles Ohio. The North Country National Scenic Trail stretches across seven states and will be 4,600 miles long when completed. These trails link and make accessible historic and scenic features and provide long-distance hiking. This mile-long, 185-acre lake is fed by water from the Mad River and is part of a system of ponds, lakes and lagoons located in the area that serve as artificial charge basins for the Dayton well fields found nearby. It is a popular site for boating and fishing. In addition to its recreational uses, Eastwood Lake is well known for its migratory bird populations, including waterfowl, osprey, shorebirds, and gulls. A viewing area for a pair of Bald Eagles nesting in the well field across Harshman Rd. has been designated at the east end of the lake. This free-flowing spring-fed river is known as a premier paddling spot for the region. The Mad River boasts Class 2 river features along with access to the some of the region’s best recreation spots. Many paddlers access the Mad River at Eastwood MetroPark and are able to travel 4 miles of uninterrupted flow to RiverScape MetroPark in downtown Dayton. The Mad River is a smallmouth bass stream south of Springfield to merger with Great Miami River in downtown Dayton. The Mad River was designated as a state water trail in August 2010. The Mad River Run is part conservation, part recreation. This man-made in-river feature completed in 2013 stabilized and restored a section of river while adding kayak and canoe ‘whitewater’. Deep water holes formed by the water flow around the rock structures offer great fishing honey holes. The Mad River Trail runs through Eastwood and connects downtown Dayton with Wright Patterson Air Force Base, the Air Force Museum, Huffman MetroPark and the Huffman Prairie Trail, and the Kauffman Avenue Bikeway which extends to Wright State University and Fairborn making Eastwood a great place to park and ride the nation’s largest paved trail network. The Creekside Trail begins at Eastwood MetroPark, passing through both residential and commercial areas before meeting its intersection with the Iron Horse Trail near US 35 (which take users through Kettering to Delco Park). Here, Creekside heads due east along the highway, and eventually passes over the Montgomery County line into Greene County. Grassland openings along the Mad River are former prairies that retain the rich prairie soil and lend themselves to prairie restoration. The Mad River Trail winds through these grasslands on the eastern end of the park offering opportunities for spotting brightly colored life. Goldenrod, milkweed, and asters bloom with flowers visited by dozens of different butterflies, including Monarchs. Grassland songbirds, including meadowlarks and savannah sparrow come to eat, breed, and nest. This 1/2 mile trail stretches from the lagoon inlet, through a wooded serene area to the outskirt of a grassland prairie view. It winds around the southeastern border of the park and through a tunnel that goes under the main entrance of the park. Users then can turn around and go back where they started for a short hike or may continue on past the tunnel and take the Buckeye Trail along Mad River and have longer hike for a 3 mile loop. There are handicap accessible flush restrooms at both the Main and Lake sides of the park. These restrooms are open seasonally from April 1-October 31. There are portable toilets open all year round throughout the park. There are drinking fountains at both the Main and Lake sides of the park. They are located in open areas near the restrooms and the shelter/playground areas. There is handicap accessible parking areas and an accessible restroom adjacent to the last parking lot at the Main entrance. This location also features one accessible picnic shelter, the Mad River shelter, which is available for reservation. Take RTA Bus Route 11 west from downtown to the intersection of Springfield Street and Harshman Rd. The park entrance is northwest on Harshman approximately one mile at 1385 Harshman Rd. Bike and pedestrian access is available via Creekside and Mad River Trails. Eastwood MetroPark has amenities for just about any type of boating available. On the lake, power boats, water skiing, wake boarding, tubing and fishing boats are permitted on the even dates of the month; sailboats, personal watercraft and fishing boats at idle speed are permitted on the odd dates. Kayaks and canoes are permitted all days of the week. Personal watercraft must use the designated area marked with buoys at the west end of the lake, and there is a speed limit of 35-miles per hour for all watercraft. The Blue lake and the lagoon offer boating access for boats that are people-powered or electric motors only. Events like the Annual Test & Tune, APBA Driving School and the Solar Splash are held at the lake each year. Check our calendar for upcoming events. 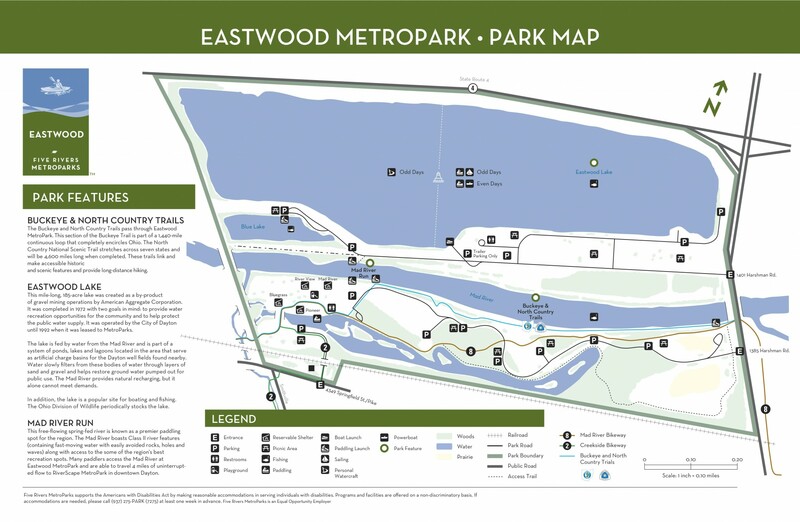 Eastwood MetroPark is connected with downtown Dayton by the Mad River Trail and with Beavercreek and Kettering by the Creekside and Ironhorse Trail. The Mad River Trail also connects this park with Huffman MetroPark, Wright-Patterson Air Force Base, Wright State University, plus the Fairborn and Riverside communities. The park’s riparian forest habitat along the Mad River includes is skirted by grasslands and young forest areas that are experiencing natural succession. The grasslands that your see as you enter the main entrance of the park are actually small portions of prairies that once blanketed the Mad River valley. These remnants retain their rich prairie soil and are actively being managed by MetroParks for prairie restoration. The many water features in Eastwood, including lake, river and lagoon, are well known for attracting migratory bird populations, including waterfowl, osprey, shorebirds and gulls. In 2009, a pair of bald eagles, known as Cindy and Jim, began hunting at Eastwood Lake and along the Mad River after building their nest across Harshman Road in the treetops above the City of Dayton Mad River Well Field. In 2016, Cindy died after carrying a wet branch back to the nest that made contact with a power line. MetroParks conservation staff members are working to promote fish and wildlife populations in the lake and lagoons, as well as encouraging the birds and insects of the park’s prairie ecosystem. Native shrubs are being introduced to establish a thicket habitat, important to many types of wildlife including cottontail rabbits, yellow breasted chats and willow flycatchers. The Mad River Run, which opened in 2013, was a project that was part conservation and part recreation. This kayak and canoe ‘whitewater’ feature along the Mad River includes significant bank stabilization measures, and restores a section of river from Eastwood MetroPark to downtown Dayton to as much natural functionality as possible. It improves public access, aquatic habitat and safety characteristics of the river. Eastwood Lake – The lake has many species of fish as it is fed indirectly by the Mad River and has been and will continue to be stocked by ODNR. You can fish by boat or from the shoreline. Some of the more sought after fish are walleye and saugeye, crappies, catfish and largemouth bass; however many other species have been caught, like bluegill and other sunfish, carp, smallmouth bass, rainbow trout as well as an occasional exotic (Please contact the Wildlife Biologist if you catch an exotic fish, we wish to keep our species native and an exotic could become detrimental to the natural ecosystem). Eastwood Lake is open 24/7 (for fishing only) from April 1 until October 31. Mad River – Smallmouth Bass, Largemouth Bass, Rock Bass, Bluegill and Carp can be found in the city limit section on the Mad River. Did you donate a Christmas tree last Christmas? You can view a map of where the trees were placed. The 3-mile loop in Eastwood’s main park offers trail runners a soft surface run through woods, open meadow, and riverside trail. The park’s paved trail access provides runners, walkers, cyclists and inline skaters with a 3.61 mile jaunt to RiverScape MetroPark down the Mad River Trail – just over 10K for a round trip. Create your own distance using the Mad and Creekside Trails. Boat access points on the lagoon, blue hole or lake provide multiple spaces for SUP yoga. Enjoy a day of bird watching, regular residence of kingfishers, great blue herons, great horned owls make this MetroPark a favorite spot for birders. This park offers a good chance to observe migrant waterfowl, gulls, terns, and swallows, as well as a chance of finding something rare. Eastwood Lake is well known for its migratory bird populations, including waterfowl, osprey, shorebirds, and gulls. Five Rivers MetroParks habitat and clean waterways conservation efforts have been rewarded with the return of American bald eagles. Perhaps you’ll catch a glimpse. Two bald eagles, known as Jim and Cindy, nested across the road from Eastwood MetroPark at the City of Dayton Mad River Well Field. The pair had hunted at Eastwood Lake and along the Mad River after building their nest in 2009. In 2016, Cindy died after carrying a wet branch back to the nest that made contact with a power line. Check out the “urban prairie” just inside the main gate of the park. These grassland habitats are under a prairie restoration and draw in cottontail rabbits, yellow breasted chats and willow flycatchers. Healthy habitats like those at Eastwood support wildlife like the chimney swift. You can spot this aerial hunter in Eastwood MetroPark. Bike the Buckeye Trail and look for nests built along the side of the Harshman Drive overpass. Look for beaver activity as you explore the lagoon with a walk out on the islands. Mad River and the lagoon provide opportunities to see river otters, migratory water fowl, osprey, kingfishers and bald eagles. Geocaching is an activity combining technology and nature, using GPS to search for and find “caches” hidden throughout the world. Visit www.geocaching.com and search by location to get started, and then head out on an adventure to find the geocaches hidden in this park. The land that Eastwood MetroPark stands on has ties back to Dayton’s very early history. It is reported that in 1802 there was a grist mill at the site of present Eastwood Park. The Miami Conservancy District bought up all the land subject to flood or change in any way by their construction of an earthen dam on the Mad River after the flood of 1913. After construction was complete, the city of Dayton bought the river bed to Huffman Dam as a right of way to carry the drinking water from their wells to pumps. The city then developed the area into a park by 1917. Five Rivers MetroParks entered into a lease agreement with the City of Dayton to allow MetroParks to manage the Eastwood Park in 1990. The park has over 3 miles of wooded and open meadow trails for walking, hiking, running. It offers scenic views of the Mad River and native prairie plantings. The Buckeye Trail (BT), Ohio’s State Trail, and the North Country National Scenic Trail (NCT) run together through Eastwood MetroPark. These long distance trails are co-aligned through the Dayton area as they are through much of Ohio, locally following the Mad River and Great Miami Recreation Trails. The trails are marked by 2×6 inch blue blazes along the route and volunteers work closely with the land managers to promote the trail and maintain the blazes. Learn more about these trails. Eastwood MetroPark contains a winding shaded lagoon, a 185-acre recreational lake, forest habitat along the Mad River, thickets, and a few grasslands. These grassland openings are former prairies that retain the rich prairie soil and lend themselves to prairie restoration. In addition to its recreational uses, Eastwood Lake is well known for its migratory bird populations. Children are sure to enjoy the playgrounds near the beautiful shady picnic areas at Eastwood MetroPark. The playground features a safe environment for kids to slide and climb and multiple seating areas for parents to relax under the shade of Eastwood’s tree canopy. Make sure to explore the nearby Mad River Run – you might inspire the inner kayaker in your child! This small, sheltered, lake at Eastwood MetroPark which is a great place for beginners to try paddlesports for the first time. Use the 1401 Harshman Rd entrance, and drive all of the way to the other end of the park. 185-acre Eastwood Lake, also known as the “hydro bowl” is a nice sized lake to take you paddling to the next step. This lake is often windy which can create decent sized whitecaps and has motor boat traffic. There are numerous locations to put your canoe, kayak, etc. into the lake. You can paddle on Eastwood Lake any day of the week – please take note that motor boats drive fast on even numbered days, and on odd numbered days Personal Watercraft (PWCs, aka jet skis) use the west end of the lake. The Lagoon is ~3/4 of a mile long, has 7 islands, docks, and a ramp. The Lagoon can be accessed by the docks near the restroom or by the ramp off at the corner of the last parking lot. This is a great body of water for beginners to explore. Looking for a trip on the Miami Valley’s only whitewater river? Then the 4 mile long Mad River is for you. This access point includes a changing booth, portable toilet, and parking. Carefully cross the bike path and put your boat into the river. Part conservation, part recreation, Mad River Run offers man-made Class 3 white water rapids. Access to the whitewater feature from river left. This is a good spot for experienced paddlers to quickly play in the whitewater feature. Access to the Mad River Run whitewater feature from river right in the pool above good for intermediate to advanced paddlers, allowing for a brief warm up. Reserve shelters in the park for your exclusive use using our online reservation system. Unreserved shelters are available on a first-come, first-served basis. Picnic table sites also are available. The park’s 3 miles of wooded and open meadow trails for are relatively flat and make for good cross-country skiing or snow shoeing with adequate snow fall. The paved trails are not plowed in winter and can also be used for skiing and snowshoeing. The 441-acre MetroPark sits at the confluence of regional water, hiking and biking trails. It offers a range of recreational opportunities in a convenient location and natural setting.